This isn't so much a review as an appreciation. Recently, I experimented with a low sugar diet. The experiment only lasted about three days, but it did yield some unexpected positive results... I found a sugar-free pancake syrup that I love. About three hours into my new diet, I started to crave pancakes. With enriched flour and sugar off my menu, a stack of hot cakes dripping with sweet syrup seemed out of the question. How do committed dieters address theses intense pancake cravings? Here's how: a good whole-wheat pancake batter and Northern Pines Sugar-Free Pancake Syrup. This syrup doesn't taste like pure maple syrup. It's flavor is more similar to Aunt Jemima and other maple-flavored syrups. Personally, I like that flavor. It's the kind of syrup my mom used. I was very happy to find a satisfying sugar-free substitute. Most sugar-free syrups serve up an unwelcome, artificial aftertaste. Fortunately, that's not so much case with this syrup. I won't lie. If you concentrate on the flavor and search your palate for the presence of Nutra-Sweet, you'll find it. But if your focus is aimed more toward enjoying pancakes than criticizing sweeteners, you're likely to forget that you're tasting a sugar-free product. In short, with this syrup you can still have syrup on a low-sugar diet and not feel like you're giving up flavor. 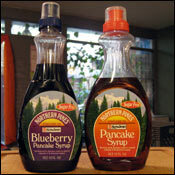 I'm also going to recommend Northern Pines Sugar-Free Blueberry Syrup... but with two reservations. Their blueberry syrup is satisfying sweet and loaded with a blueberry flavor. Unfortunately, the color of the syrup is more chocolate brown than blueberry blue and makes for a less-than-picture perfect pancake breakfast. The taste of artificial sweetener is slightly more prevalent in the blueberry variety. That said, this is still one of the better sugar-free blueberry syrups on the market. Northern Pines has been in the pancake business for some 30 years. In addition to syrups, they offer a variety of pancake and other baking mixes - all of which are top quality. For more information or to order any of the products mentioned here, visit northern-pines.com. The $0.0 price tag reflects that samples of this product were sent to Mr Breakfast by the company. What do you think of Northern Pines Sugar Free Pancake Syrup? I tried it first at a restaurant this morning. I am ready to buy my own. Delicious!